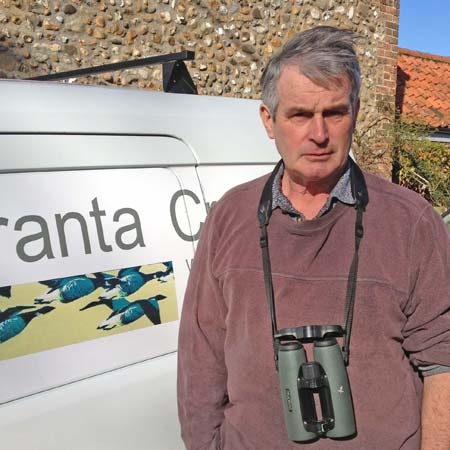 Jon has been involved in fishing and nature conservation for over 45 years in Brancaster Staithe; an interest kindled by his grandfather who was a mussel/whelk fisherman and Bob Chestney who was the warden at Scolt Head during his childhood. Five years ago Jon and his wife Judith set up Branta Cruises offering intimate and personalised tours around Brancaster Staithe Harbour and Scolt Head Island in their boat Laura May. Leftleys at Burnham Deepdale, friendly staff and all you need on your doorstep. The Dabbling Duck at Great Massingham, a quiet corner of Norfolk. Along the northern edge of Barrow Common, Brancaster Staithe, with views west to Boston Stump, east to Blakeney Point and Scolt Head to the north. The Lord Nelson, Burnham Thorpe, in quiet times you can imagine Nelson himself coming in for a nice pint of Abbot Ale. Transporting a stranded porpoise across Scolt Head to the open sea, having to wade out, waist deep, through the surf in freezing cold March seawater. A lovely remote part of the North Norfolk coast. Thanks to the foresight of those who acquired Scolt Head Island nearly 100 years ago this remains a safe haven for us and wildlife.